Whether you are looking for a romantic cabin getaway or a great family adventure, "Water, Wines in the Pines" may just be the place for you! This stunning chinked log cabin has been furnished and decorated with beauty and comfort in mind. 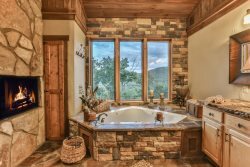 Privately situated on "Clear Creek" and only a few short minutes from one of Ellijay's finest vineyards, Cartecay Winery, you will be able to experience what all the fuss is about here in North Georgia! The large covered back porch has plenty of comfortable seating and a view of the creek that is not only beautiful but relaxing as well. Enjoy a glass of wine or your favorite beverage in front of a crackling fire on the back porch, listening to the different sounds of nature around you. Walk down to the creek on a hot day and enjoy the cool mountain waters or try your luck at snagging one of those native brown trout that this creek is best known for. Take the kids creek side to enjoy a campfire, perhaps a ghost story or two and of course some tasty roasted marshmallows! Inside, you have all the comforts that our guests have come to know and expect. From the beautiful furnishings to the well equipped kitchen, this cabin is one that you'll long to come back to time and time again. With a gas fireplace on each level, and large TV's in both living areas, there is plenty of space for privacy, whether it's couples or mom, dad and the kids. Oh, did we mention that Fido is welcome too? That's right, this is a place that the whole family can enjoy and there is even a bed and food/water bowls for them too! Oh, forgot to mention, there is a fenced in area off of the lower deck where they can help themselves to a "potty breaks" at their convenience and in safety! Words can't really say enough about this cabin, you have to experience it, and once you do, we know you'll be thrilled you did! "Water, Wines in the Pines" is conveniently located in Ellijay, about 7 miles from downtown where unique shopping and fabulous local dining await you! So don't wait, the "Water, Wines in the Pines" is calling for you! Fully equipped kitchen: Refrigerator, stove, oven, microwave, dishwasher, toaster, kurig & auto drip coffee makers, dishes, glassware, utensils, cutlery, pots, and pans. The cabin was very clean and welcoming and the views are stunning. Just a beautiful house, great views and ambiance, easy to enjoy with the proximity of the porch and outdoor fireplace to the kitchen and living space. We could hear the creek from the house and my toddlers enjoyed going down and playing in it a few times. The house was great for families with little kids, the porch was safe and secured so we could let them have free reign. Perfect for a fall getaway. Beautiful cabin w/ all the amenities needed and a beautiful shallow creek in the back, prefect for little kids to play in. I usually like to get a different cabin everytime but i would love to come back to this one. Would be even better if it had a hot tub. Especially enjoyed the deck. Enjoyed hearing the rushing water from the river. Bed in upstairs level very comfortable. I would love to stay here again. So comfortable and homey. Clean, etc. Incredibly Beautiful Cabin, Perfect get-away! My family and I stayed in this cabin for an anniversary celebration, and we truly loved our stay. The home is so warm and welcoming, and perfect for families with pets. The cabin was spotless and clean upon our arrival, and we immediately felt welcomed in this space. I can't say enough good things about it. We will definitely be back, thank you for a beautiful trip! Thank you for a visit that surpassed our expectations and creates a space to make wonderful memories. The cabin was immaculate inside and out. It far exceeded our expectations. The cabin is private and yet we felt very safe. We did not want to leave. Every attention to detail is provided for - it is complete bliss! We have stayed in the elijay/ blue ridge area several times . The area is very special to our family. Two years ago and 4 days after we returned from one of the best times our family had ever spent together. Our 8 year old daughter Ella passed away suddenly. Some of her last days we had with her were spent in the Elijay /Blueridge area. Those memories we will forever treasure. It took us 2 years to be able to return and we couldn't of chose a better place to stay , to create new memories while holding on tightly to the ones before. This cabin has been our favorite one yet and it was very hard to beat the last one. The creek was just FANTASTIC , the fire pit creekside was such a blast we spent hours out there. The kids had an absolute blast. The cabin we didn't want to leave it was so beautiful and the Netflix on the TV was a huge bonus. We stayed an extra day because we didn't want to ever leave. Already planning our next trip In the fall. Thanks again for sharing your cabin with us. Customer service was spot on! The cabin was so beautiful and perfect in every way. Thank you!